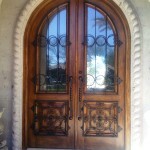 If you’re looking for “Iron Entry Doors Glendale“, Artistic Alloys & Design, Inc. can help! Give us a call at (480) 941-2611 for more information. All of our front entry doors are made from iron and are custom built to your specifications to make sure that there are proper design and fit aspects. You can look at our custom iron doors that we have created or you can work with our door fabricator to help you to design your very own custom iron entry door. We are able to make just about any style of custom door that will fit the overall look of your business or home. 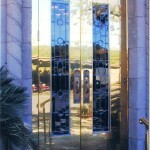 Artistic Alloys offers high quality iron entry door installations in Glendale, Arizona. We offer many different style and metals for you to choose from. Read more about our services below. 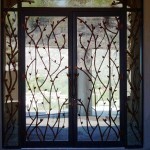 Your choice of custom door handles, custom paint finishes, decorative glass, and more.Here at Artistic Alloys LLC, we are the top producing manufacturer of wrought iron entry doors, custom metal and steel doors for residential and commercial properties within the Glendale East Valley area. For narrow main entryways or side doors, Single entry doors are great. The properties they offer are stylish elements and are visually stunning that welcomes visitors to your property. In able to receive larger deliveries of appliances, furniture and other large or heavy items Double entry doors are a modern necessity for most businesses and homes. 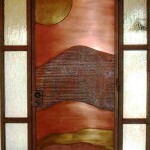 To make it easier to see who is at your door, and to let natural light in, a popular option for entry doors is glass. 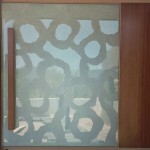 By choosing glass, you have the choice of clear, decorative, or frosted. From straight bars to metal designs that have geometric designs, and shapes from nature, we are happy to be able offer our customers any design of wrought iron. We can create stunning modern or traditional interpretations of iconic entry doors in centuries past were made from a combination of iron and heavy wood. Artistic Alloys LLC is Glendale, Arizona’s top fabricator of wrought iron entry doors, custom steel and metal doors for commercial and residential properties. All of our front entry doors are custom built to your needs to ensure the right fit and design. You can look at doors we have already created or you can work with our fabricator to design a custom door. We can make just about any style of door to fit the look of your business or home. Being able to have an iron exterior door installed within your front entry way is a great way for you to upgrade the look of your home. Your entry way is a focal point for your visitors and Artistic Alloys can completely customize your design for an iron exterior door, make it in our shop, and then securely install it in your home. 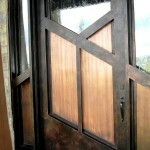 There are a lot of ways that having a custom exterior door of iron that is added to your home will benefit you. 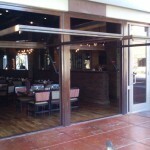 Below are a few ways that installing these doors will improve your business or home. Undeniably Unique Exterior Doors – We will use years of welding and metal fabrication experience to create a one of a kind item for you. We can help to take that old front door and turn it into a grand entry way that sets the mood for your guests. Increased Property Value – Adding iron exterior doors will do more than just make your home unique, it will increase your property value. It will be safer, you’ll have a beautiful entry way and you will improve your homes curb appeal. Doing this means that whenever you are ready to sell, after enjoying your investment for years it can repay you in added value. Aesthetically Secure – Not only are iron exterior doors great looking, as well as a great way to set your business or home apart from others, they are also a great way to increase security. The mountings, locks, and hinges are made very strong and can help to discourage any intruders. Career criminals will know from the curb that businesses or houses that have iron exterior doors are not an easy target, and will look for homes that have basic fiberglass doors. Customized Durability – The designs that we create are not made to be disposable. We build our exterior doors to last. Iron is very durable and with expert welding, we are sure that they can withstand the punishment of weather in Arizona. These doors are meant to be a permanent and beautiful addition to your business or home. Your iron exterior doors will welcome your guests for many years. The custom iron doors made by Artistic Alloys come in all shapes and sizes. This makes matching your home’s aesthetic a breeze. Old World Character – When you choose elements from popular architectural styles from the middle ages, you can get that old world feel. These doors will have elements such as oversized hinges, wood panels, and large metal rivets. 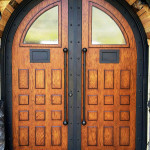 The style of door will match well with stone work or arched elements. If the robust hinges and wood panels are good enough to stop invaders, then it is good enough to protect your home. Rustic Charm – The feel of deep woods, secluded cabins and high mountains can be built into your iron door. 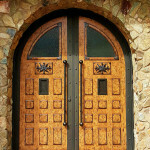 Rustic doors will normally have scrolling patterns that incorporate leaves, vines and even flowers. Our master fabricator abilities will allow the details to flatter your home and leave your guests in awe. Classical Posts – The embellished horizontal and vertical bars that have windows are the best for a classical iron door. These doors are personalized by picking out a different embellishment, and spacing for the bars as well as customizing the quantity and size of the windows on the door. 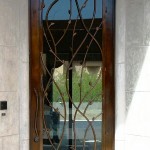 Modern Mystique – Classic and traditional iron doors will often have swirls, loops and bars as part of the motif. 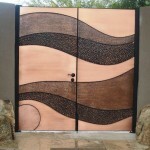 Modern iron doors will includerectangles, circles and geometric patterns that are within other shapes. 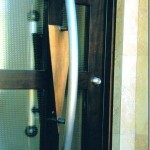 While the doors feature modern patterns, they are quite strong and will keep your family and home safe while in style. 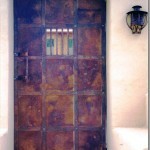 If you’re looking for “Iron Entry Doors Glendale“, Artistic Alloys & Design, Inc. can help! Give us a call at (480) 941-2611 for more information. Building Custom Creations For Over 20 Years! 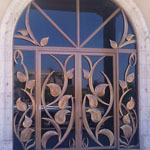 If you’re looking for "Iron Entry Doors Glendale", Artistic Alloys & Design, Inc. can help!